Tonight, after dinner, baths, and a lot of screaming, my wife and I will settle down next to our toddlers and attempt to inculcate them into the Christian mythos telling them the stories of Abraham, Rahab, Paul, Silas, and the rest. Sometimes we read from our own leather-bound Bibles, but most nights we use books with titles like the The Jesus Storybook Bible and The Beginner’s Bible, and yes even one called Princess Stories: Real Bible Stories of God’s Princesses. I deeply appreciate the role these books are playing in forming the imaginations of our children. However, there are times when I find that a story I want to tell them isn’t included in these books, and sometimes the stories are a little too sanitized for my tastes. I don’t really mind this, because it lets me add little artistic flourishes (“David didn’t just defeat Goliath, he cut of his head!” “And then Elisha sent bears to eat the disrespectful kids!”) or pull out the “Bible without pictures” from time to time. Malley arrives at this concept by listening to how members of a specific church under his study referred to “the Bible.” Here we will look at broader data focusing on products that use the term “Bible” in their title and attempt to see what that means for how Christians understand the word and the concept of “Bible”. Does ‘Bible’ Mean All 66 Books? 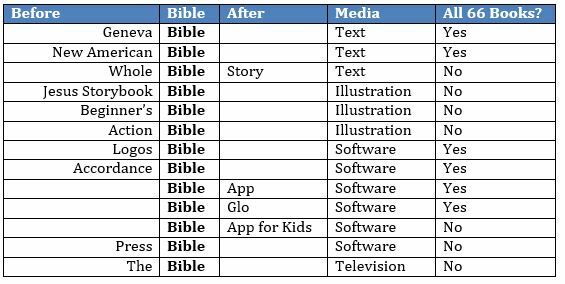 When publishers and content creators add a descriptor before or after the term “the Bible” it can mean a variety of things. 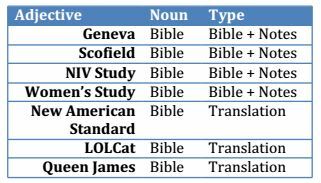 Sometimes the descriptor is used to indicate a unique translation of the Bible such as the New American Standard Bible and the Holman Christian Standard Bible as well as less well known versions like the LOLcat Bible and the Queen James Bible. Publishers have also use “the Bible” with descriptors to indicate the addition of various systems of cross-references, notes, maps, and pictures. This goes back as far as the Geneva Bible (1560), and continued through influential titles like the Scofield Reference Bible, the Thompson Chain-Reference Bible, Ryrie Study Bible, the NIV Study Bible, and the Women’s Study Bible. More recently, however, the term “Bible” is being used not as the primary noun, but as an adjective describing something else. This will be detailed below in products like “the Bible App” and others, but first it maybe be helpful to see how this use of “Bible” as an adjective or category is similar to the multiple uses of the term “biblical” in products and Christian speech.In each case, the term “Bible” is a proper noun indicating a book that contains the entire Protestant canon, and is preceded by a description of the translation or the added parts. What Does it Mean to be ‘Biblical’? The word “biblical” is an adjective that English speakers would normally place before a noun. The most obvious use of the term would indicate a direction relation to the Bible such as “Biblical Criticism” (the study of manuscripts of the Bible), “MA in Biblical Exegesis and Linguistics” (a Bible translation degree from the school where I work), “Jeremiah is a biblical name” (i.e. it is found in the Bible). Finally, there are also outlier projects that use the term “biblical” more broadly in a sense more like “related to the Bible in some way” such as this fine Biblical Essential Oils set. 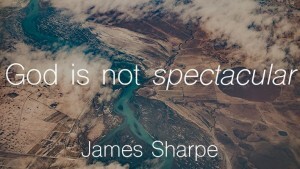 Linguistically, then, “biblical” is a fluid concept with varying degrees of closeness to the actual text of the Bible.There are also ambiguous uses of the term “biblical.” For example, does Haddon Robinson’s book Biblical Preaching refer to preaching “in a manner consistent with” the Bible or to preaching “directly from” the Bible (both are intended with an emphasis on the latter)? My own institution has a degree called the MA in Biblical Counseling which merges both of these meanings. Students receive quite a bit of training in the exegesis of the Bible (the first meaning), but they also receive training in modern psychology and how to integrate both fields in a way that is intended to be consistent with Scripture (the second). Others use the same term “Biblical counseling” to refer to counseling that uses “the Bible” as its sole source of truth, avoiding any influence from other disciplines of knowledge (e.g. Nouthetic counseling). Does Every “Bible” Have “the Bible” in It? 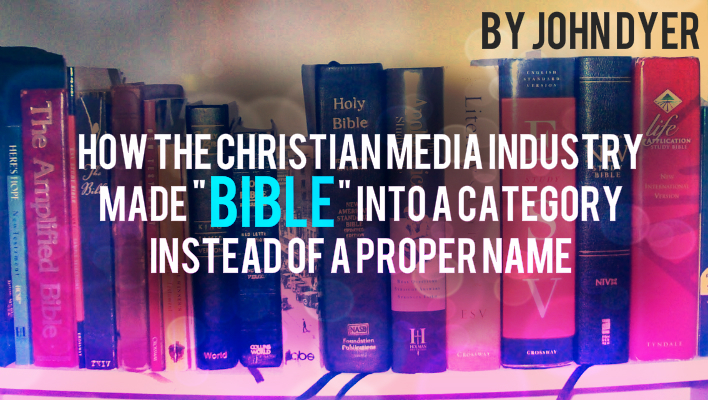 Moving from the various uses of the adjective “biblical” to the idea of the noun “Bible,” we also find a variety of meanings and naming conventions, especially of newer products related to the Bible. While study Bibles and other audience-focused products tend to use the “adjective + Bible” convention (Soldiers Bible, Fire Bible) to denote a complete Bible with additions, in the world of children’s books “adjective + Bible” usually means an incomplete Bible with stories and themes intended to be accessible to children (The Jesus Storybook Bible and The Beginner’s Bible). In addition to the children’s books, there are titles that use the formula “adjective + Bible” to denote a product that refers to stories in the Bible but often present them in a different media such as comics (The Action Bible) or LEGO bricks (The Brick Bible). But not all products named this way are visual Bibles. Several Christian publishers have recently created text-based products designed to give adult readers an overview of the main plotline or story of “the Bible.” To varying degrees these use the term “Bible” in the title or subtitle. See for example The Story: The Bible as One Continuing Story of God and His People includes passages from the New International Version (NIV) and additional “transitions” to help readers see connections, while The Whole Bible Story: Everything That Happens in the Bible in Plain English doesn’t use any directly translated passages but is rather a unique novelization that attempts to show how all the stories fit together cohesively. For example, one software application is alternatively called “Glo,” “Glo Bible,” and “Bible Glo.” It contains the entire text of all 66 books plus notes and other add-ins, but more interesting than the content is how the naming convention switches the word order under certain circumstances. My guess is that the two names are there to ensure that when a user searches for “bible” in an App Store (such as Apple’s iTunes), “Bible Glo” appears earlier in the search results (compared to “Glo Bible”). This may indicate that the priorities of digital marketing are driving new naming conventions. While these examples are relatively clear since they contain the entire Bible (plus additional features like reading plans, notes, illustrations, etc. ), there are other uses of the term “Bible” for software that does not contain the entire text. For example, YouVersion’s “The Bible App for Kids” follow’s its grown-up naming convention but instead describes an interactive game and story-telling application. It functions much like the Bible products marked to children mentioned above. The recently released “Press Bible” also contains stylized versions of books of the Bible (currently the Gospel of John) with interactive elements. In this brief product survey, I’ve attempted to show that content creators and Christians use the term “Bible” not simply to describe an object or definitive set of texts, but as a general category of things related to those texts. In many cases where the term “Bible” is used to describe something that is not “the Bible” proper, the rationale appears to be a move away from plain text toward visual media such as “The Bible” television series, “The Beginner’s Bible” illustrated children’s book, and “The Bible App for Children.” But even for plain text products, content creators seem to feel freedom to use the term “Bible” freely. There are some cases when a product is named in such a way that clearly states it is only derived from the Bible (such as Princess Stories: Real Bible Stories of God’s Princesses), but these are the exceptions where the rule is free usage. One might easily conclude, then, that free usage of the term “Bible” in the publishing industry has, at least in some small way, contributed to the general confusion and sharp differences over what means to live a “biblical” Christian life. Moreover, one might ask in this age of products, software, and movies, what does it mean to be a “people of the book”? 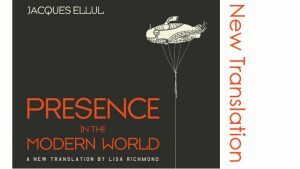 Presence in the Modern World by Jacques Ellul--A New Translation! Second Nature depends on the generous donations of readers like you. Second Nature is published by the International Institute for the Study of Technology and Christianity (IISTC), a 501(c)3 non-profit dedicated to studying technology in light of the Christian tradition. Your generous contributions make this work possible. Please consider donating today to help us continue this important work. John Dyer is the Executive Director of Communications and Educational Technology for Dallas Theological Seminary. A former youth pastor and long time web developer, he has developed tools for Microsoft, Apple, Harley-Davidson, Anheuser-Busch, and the Department of Defense and now writes on technology and faith for publications such as Christianity Today and Outreach Magazine. His first book is From the Garden to the City: The Redeeming and Corrupting Power of Technology, and he is currently working on creating software to distribute digital Bibles in closed countries. Sign me up for weekly updates! Second Nature is an online journal for critical thinking about technology and new media in light of the Christian tradition. Sign up for our weekly newsletter update! If you find value in the work we do at Second Nature, please consider making a modest donation. Every donation, no matter how small, is a huge encouragement to us in our work.